Simply move the stop to the correct setting and let go. The gauge aligns itself to the dimension you selected. It's as easy as squeezing the handle on the Quick Loc system and sliding the Quick Loc to the setting. The investment will be quickly returned jn lower costs, reduced makeovers and less waste. While the teeth align the stop to the dimension you choose, they also add incredible strength. Once set, the teeth guarantee the stop will never slip or move. The teeth in our stop systems allow operators to increase accuracy, reduce set-up time, and eliminate waste. Our exclusive teeth feature allows you to quickly set our Quick Loc Stop using the built in measure. In seconds, your workstation is set up and locked in. Simply Squeeze the handle on the Quick Loc Stop system, slide it into position and release it. The teeth engage and once set in place cannot slip! Riser Bracket allows you to cut multiple pieces by stacking. 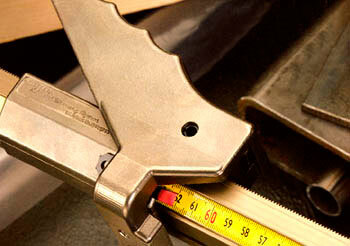 Miter Attachment for use with miter saws, accepts 22.5° to 45° angles. Fine Adjusting Knob for applications that require fine adjusting to 1/64", 1/32". Release Adapter when affixed to the Quick Loc, it enables a release of 1/8" to prevent binding between stock & saw blade. Multi-Loc Adapter allows you to use both Quick-Loc & Multi-Loc Stops on the same rail. Extension Bracket enables you to cut several pieces together, at one time.